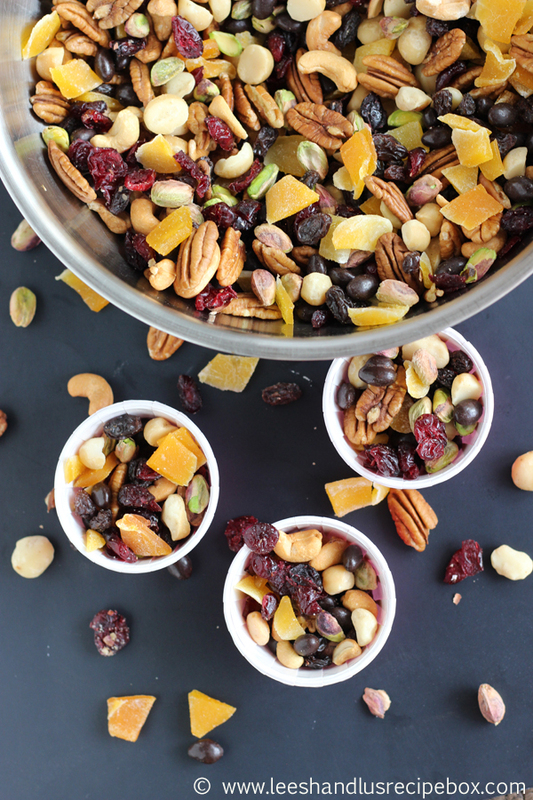 Are you ever in need of a pick me up snack? I know I am. I often get to this point in the afternoon when I'm hangry (hungry + angry). And as a mom of 3 sometimes it's hard to get a good snack in during a busy day or diapers, stories, and breastfeeding, school drop off/pick up, etc, etc. This trail mix has been my saving grace the last few weeks. I've had moments when the baby needs to eat and so do I. This is the perfect snack to hold me over until I get a chance to eat. My husband has also been enjoying it at work in the afternoon when his lunch is starting to wear off and it's not time to come home yet. And with school starting over the last 2 weeks it's been a great snack for my daughter that seems to hardly have any time to eat lunch at school. Does anyone else have kids that don't have enough time to eat? I mean, I know my daughter is a socializer, but I think the need a few more minutes to be able to eat without snarfing. 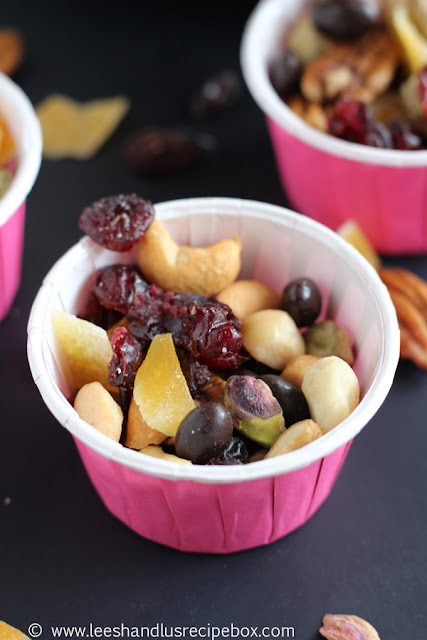 I grabbed a little cup of this trail mix to bring her when she got off the bus and she was really excited to munch on it as we chatted about her day on the walk home. She hadn't ever had macadamia nuts and asked me what they were. She liked them a lot - and I'd have to say I did too! It was a great little snack to tide her over until dinner was ready! 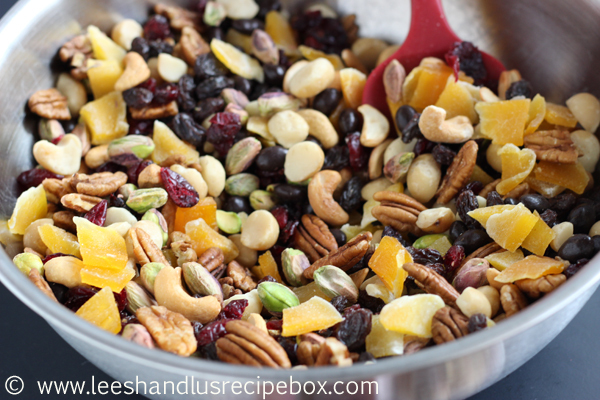 We seriously have loved the flavor combo in this mix!!!! Like a lot! My husband and I have been talking about it all week! It has the perfect amount of sweet to nut ratio with just a little salt (you can add more depending on which nuts you choose to be salted vs not). And the bits of dark chocolate seriously take this over the top! I hope you enjoy this as much as we do. This mix consists of: pistachios, dark chocolate covered pumpkin seeds (found the bulk section of Sprout's Farmers Market - any dark chocolate chunk will do though), dried cranberries, dried mango chunks (I like to buy the unsweetened organic mango strips and then I cut them into chunks with kitchen shears. 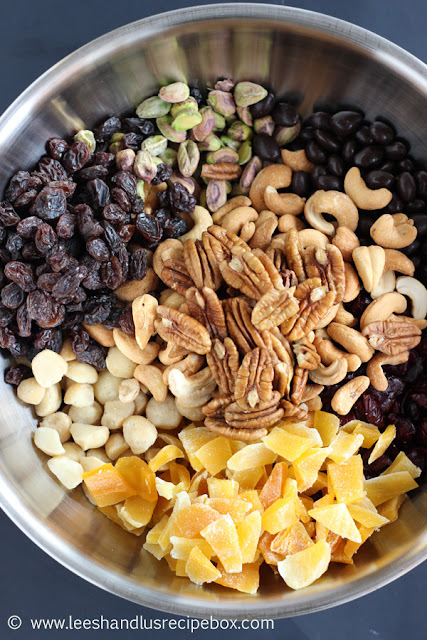 I really despise the preservative flavor on some dried fruit - so I always check the label to make sure it's just the fruit (sometimes only sugar added, but I prefer nothing)), macadamia nuts, raisins, cashews and pecans. 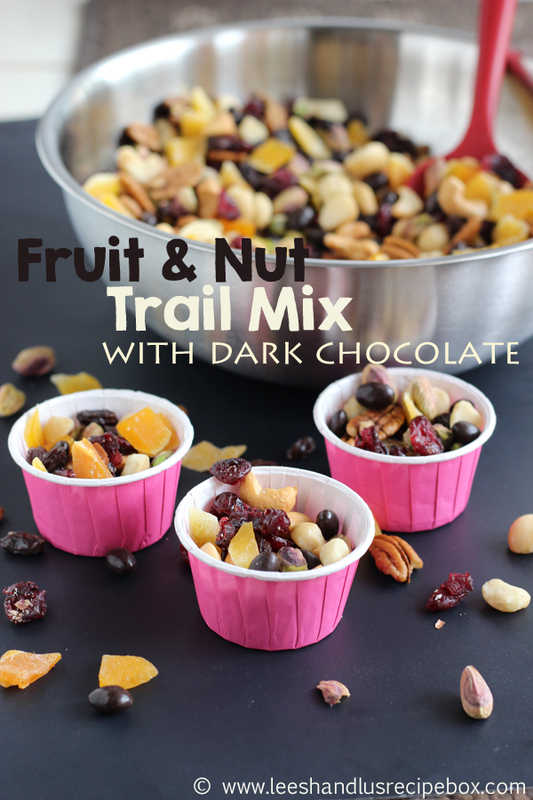 Thank you Nuts.com for inviting us to create a trail mix in celebration of National Trail Mix day on August 31st! I am not a huge salt fan, but I like a little sweet and salty mix. Feel free to choose how much salt you want in your mix by choosing salted or unsalted nuts. I only had salted pistachios and I thought it was great - although I might choose one more salted nut next time. Mix the above ingredients in a medium size mixing bowl, stir to combine. Store in a cool dry place in 2 quart jars or a gallon size zip lock back. It makes about 2 quarts of mix. Scoop out ¼ cup or so for a serving. Enjoy!